These lanyards are perfect for carrying ID badges or other passes, keys, phone or ipod at work, at a conference or at a whole host of other venues. They carry our name and the five symbols – each is printed fouur times along the length. They are bold and unmissable! If this does not provoke a conversation, we don’t know what will! The technical stuff…flat lanyard, 15mm width, 900mm length, trigger clip. Each lanyard has a safety buckle, so if it got caught or someone pulled on it firmly, it would simply come apart. They come in four colours – navy, red, purple and black. Key rings, like your keys, go with you wherever you go! So, you’ll always have the five symbols with you, to explain to the curious. 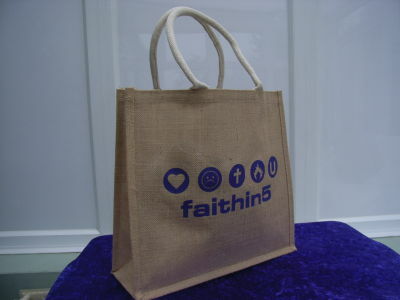 Our stylish Jute bag (new for 2009!) is the perfect environmentally friendly bag made from natural products. It bears our eye catching 5 symbols – big and bold! It stands 37cm tall and 40cm wide, with a 14cm gusset. The standard length handles are just the right size to carry the bag on your shoulder or by your side. Ideal as a shopping or school bag. 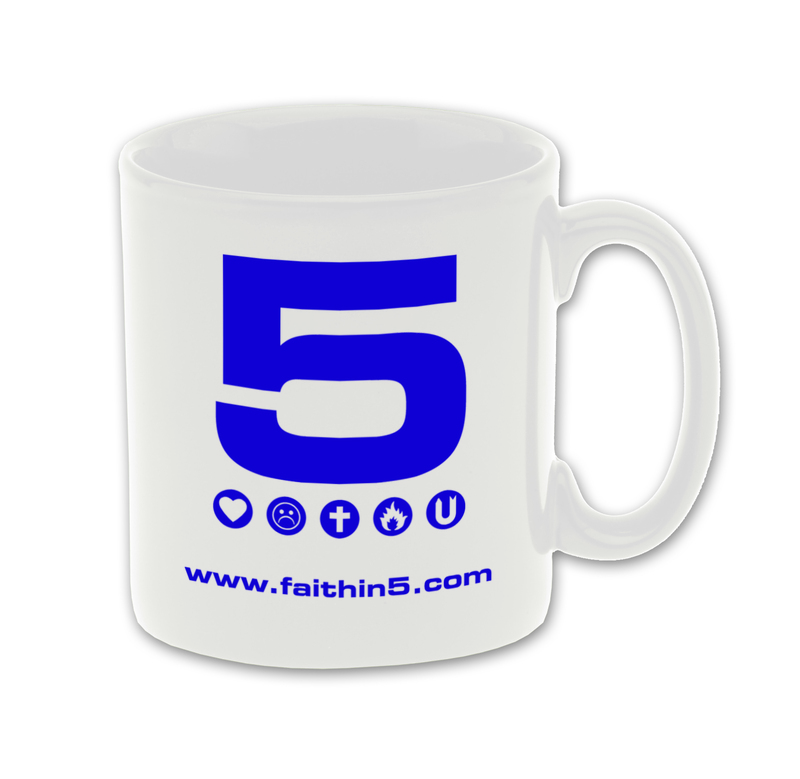 These chunky mugs display the 5 symbols in a clear and eye catching way. They are a good way to provoke conversations at home, in the staff room or in the office. 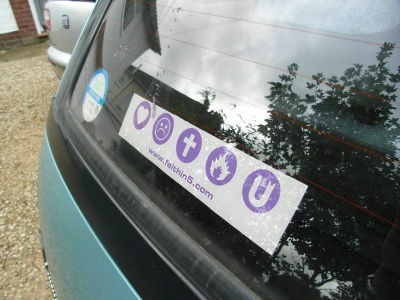 Our car stickers (22cm x 5cm) display the five symbols clearly and intriguingly. It also bears our website address so that, at the end of their journey, the driver behind you can find out what the symbols mean. 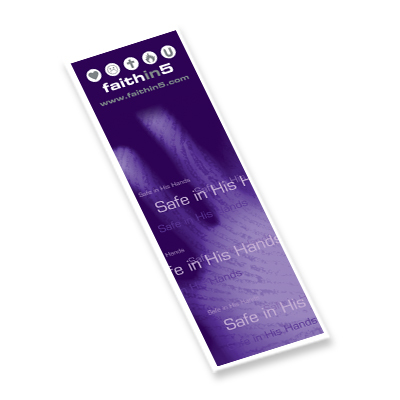 Our bookmarks (18.5cm x 6cm) are in our characteristic purple colour and are striking. Everyone needs a bookmark! These make good (and inexpensive) gifts. Stuck for a gift idea? 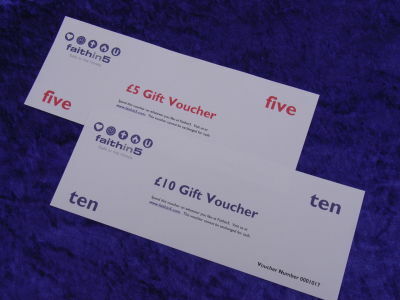 Why not buy a Faithin5 gift voucher so that your loved one can choose their own gift from our growing range. Our gift vouchers come in denominations of £5 and £10. Why therefore does it say £4.00 and £8.25 (below)? We are not trying to confuse you! It is simply because of the way that P&P is calculated on our website. We do not want to charge you an excessive amount for sending you a small item – this way, the cost to you (including P&P) is more in line with what you would expect for sending an envelope.